Our topic is helicopter with coaxial inverted sculls and dual-motor system. It is controlled by the PSOC embedded system on chip. First, we use the output signal from the PSOC embedded system on chip to control the pwm of the motor. Then, we let the up and down main rotors speed up gradually till it hovers in the sky. then, we use the different speed of the up and down main rotors to achieve turning and other actions. 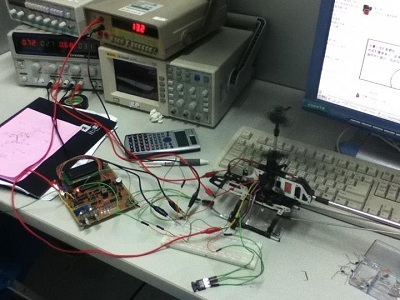 last, we use the I2c MEMS gyroscope to calculate the angle of the helicopter's moving.